Cindy Miller and Sandy Peariso enjoy appetizers and networking at the YWCA Women's Empowerment Symposium held November 7. Nearly 200 women gathered last week and all left inspired, motivated, encouraged and gained some valuable knowledge on a variety of topics. The YWCA Women's Empowerment Symposium was held Wednesday, November 7 at the Great Hall Banquet & Convention Center in Midland to support and learn about the YWCA's mission and goals of eliminating racism and empowering women. "We are excited that so many women from the region could participate in this empowering and uplifting evening. We had a diverse group of presenters and attendees, and we found this evening to be a great success not only for the YWCA, but also for the women who attended," said Linsay Cramer, development director. The YWCA kicked the evening off with a video that showcased its Getting Ahead program. The women featured briefly told their story and felt when they began the YWCA's program they had low self-esteem and no motivation. By the time graduation rolled around, they felt courageous and driven. "The Getting Ahead program empowered me to stay focused and do all I can do," said Terry, a graduate of the program. Participants emphasized how the program helped their self-esteem and enriched their life. Keynote speaker Suzanne Kart, the director of marketing of Learning Resources Network and Bay City resident, discussed the asset and challenges of having four distinct generations of American women in the workforce. In 1950 there were 18 million women in the workforce. Today, it has more than tripled to 70 million. Her discussion highlighted the importance of learning about each generation so women in turn are supporting other women. Sarah Fechter has fun getting the audience involved in her lively presentation. Sarah Fechter, owner of Sarah Fechter Fitness, challenged all to create a new habit of becoming healthy and give it their all for 21 days. The challenge could be eating healthier, drinking more water or trying a new exercise class. "Yes, it's time away from your family, and that's OK! When you give back to yourself, that me time, it makes you a better person, a better friend and a better wife," Fechter said. Give yourself three weeks before you're not feeling tired. At the fourth week, you will see the energy your body has. Don't follow a diet. Learn to make better choices. Livestrong.com has 20 ways you can incorporate whey protein into your diet. Her favorite is call UMP (Ultimate Muscle Protein) and can be found at allstarhealth.com. Whey protein helps with muscle gain, fat loss and fills you up for a longer period of time. Drink more water. The number of ounces you should drink is half of your body weight in ounces. If you weigh 130 pounds, you should drink 65 ounces of water a day. Keep a gym bag packed in your car so you are always ready to workout. Food preparation is key. Have meals planned for breakfast, lunch and dinner. Create new habits. Make long-term goals with short term steps to achieve your goals, and do it before December 31! "You don't have to be the strongest or the fittest. Just walk through the doors and get started," she said. Dan and Jennifer Digmann, authors of Despite MS, to Spite MS, gave attendees inspiration and their tools on how to write and publish a book. The husband-wife duo encouraged attendees to develop a plan, write your story, do a lot of journaling, find your niche and then make it happen. They discussed the importance of working with people in your network...that we all have those connections of who can help with the editing, the photography, design, funding and then publishing. For every book that is purchased the couple will donate $5 to the YWCA by using the code word, YWCA. Their book can be found on Amazon.com. "Everyone has a story. It's time to share yours," the couple shared. Authors Dan and Jennifer Digmann gave attendees inspiration and their tools on how to write and publish a book. Beth Handley-McMall's discussion helped attendees understand the tie between women's unique business and leadership skills and how to accelerate success in her career. Handley-McMall is a principal at Rehmann. Nikki Little, the social media manager at Identity, educated women on how to become a serious blogger and what content to write to help reach the desired target audience and grow readership. Appetizers, networking and a silent auction were also a part of the evening. The silent auction raised $2900. All proceeds of this event support programs for the economic advancement of women in the Great Lakes Bay Region. 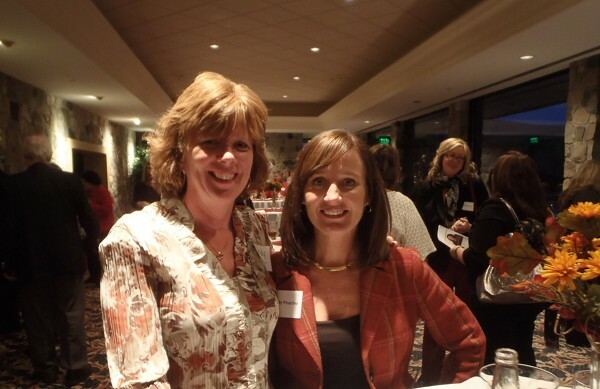 YWCA board members Laurie Bush and Pamela Monastiere had fun bidding on silent auction items. Shelley Appold, Leah Werth, Stacey Grove and Barb Engelhardt enjoyed their evening at the symposium.